If you max out the memory to 1 GB and ditch Classic (don't even install it) you will be much happier with the performance of your 400 MHz PowerBook. I have an 800 MHz iMac, and I don't see any difference in speed between them. I think the difference is the 768 MB of RAM in the iMac. I have more RAM, but I haven't got the nerve to open the case (and void my warranty) and install the second chip. First of all, it would cost a fortune. $180 for a pair of 512 MB modules. $135 to upgrade from Photoshop 5.5 to 7.0 (assuming the upgrade applies to such an old version). $285 for a copy of FileMaker Pro 6 (I'm still using 3.0). $50-180 for TextWrangler or BBEdit 7.0 to replace the free BBEdit Lite 4.6 I depend on. And then whatever it would cost to replace Mizer (an HTML compression program) and WebChecker (the best URL manager I've ever found). It would also mean ditching Claris Emailer, which has some AppleScripts I depend on for the 30 mailing lists I manage, and abandoning every game I own. Sorry, but I just don't have $700-800 on hand to do that, nor am I willing to give up the classic programs that have served me so well for years and continue to do so today. Going OS X only may be nice in theory, but it's impractical. Remember, this is Low End Mac. We're all about budget computing. Your article is likely going to cause more problems than it solves. How many people who bought Jaguar might be thinking that the update CD your article describes is the CD that they bought? Your article says: "The bad news: If you want to be up to date, even after installing Jaguar, you'll need to run Software Update three separate times to get all of the updates released since Jaguar came out." But that's just not true. To get from 10.2 to 10.2.4 requires only a single update using the combo 10.2.4 updater. The upgrade CD does only one thing - install 10.2 over an earlier version of OS X. You cannot perform a clean install of Jaguar from the CD, although you can make a modified copy that lets you do so. When I installed Jaguar, I had to go through three rounds of software updates to bring my Mac fully up to date. The 10.2.4 combo updater was only one of maybe a dozen different updates installed during this process. So, if I promise I'm not an attorney for Apple, will you tell me how to modify that Jag Upgrade Disk? I had instructions on how to do it with the 10.1 upgrade (create a disk image, remove the "CheckforOSX" file, and reburn . . . tried it (twice also) with 10.2 to no avail. Further details would be greatly appreciated . . . and by the way, I don't have the full version of Toast, only the LE that comes with the CD burner . . . will that work? I basically followed the same steps someone would take to turn the 10.1 upgrade CD into a full installer. However, I did change the name of the copy from "Mac OS X Upgrade Disc" to "Mac OS X Install CD" - that could have been a factor. I don't own a copy of Toast that works under OS X. I used Apple's Disk Copy to burn the modified CD. Is switching to/back to Microsoft a good idea? Apple isn't the only one guilty of charging their brave early adopters for the later and better(?) product. Apple hardware may be at a premium price, but it's software isn't. Allow me to put forward an example. I've been investigating into options for further redundancy of the Windows 2000 servers within my company. One of the ideas I investigated was that of the Distributed File System (DFS) - identical files and folders stored on multiple servers. The DFS decides which files are nearest to a user on the network according to traffic, server availability, etc., and the user never knows. Except it doesn't work. It goes nuts. In one trial using 10 test servers replicating 1 folder and 1 file each, we got over 650 duplicate folders and files on the DFS instead of the expected 10 on each server. Microsoft's solution: Update to the latest service pack. This was duly done, and the tests went on. The problems reoccurred, admittedly not to such a degree as before, but it's still not good enough to implement. Microsoft's solution: Buy Windows Server 2003, where all will be well. Eh? But we've bought lots of copies of Windows 2000, all in good faith. Ethically Apple may be doing a similar thing to Bill et al, but at least it's not going to cost as much to update my iMac come Panther time as upgrading to Windows Server 2003. Note: Please don't email explaining the virtues and lack of cost of any flavours of Linux as I'm not allowed to consider it as an option! I have no problem with Apple charging users for major OS upgrades; I mostly object to their failure to offer any kind of discount to those who have paid for the OS and perhaps a couple of upgrades already. I trust Microsoft solutions about as far as I trust the Department of Justice to in any way penalize Microsoft for their behavior. Microsoft promises the moon, sells based on their promises, and sometimes eventually delivers on their promise. Sometimes. Secure computing - I'm not holding my breath. If Microsoft will sell you Windows Server 2003 on a cash back if it doesn't work basis, and if it's actually possible to do a backwards migration to Win2K if Server 2003 doesn't live up to the promises, then you might want to consider implementing their solution. Otherwise, if you really want a distributed file system for your users, find an OS that makes it work - even if that means it's some flavor of Linux, BSD Unix, or Mac OS X. If your company wants you to solve the problem, they should allow you to use the correct tool. I am writing about the dual boot aspects of the iBook. I am curious as my brand new 'Book will boot from either 10 or 9.2. I purchased it last week from Apple as a new system. Could some of the new systems have the older ROM that allows the dual boot? To the best of my knowledge, even the iBooks released yesterday still allow dual booting. I am guessing that Apple may not disable that until the overhaul the iBook with a new motherboard incorporating a 133 MHz system bus and AirPort Extreme support. Just readin' your article on the Pismo.... I contacted PowerLogix about the possibility of a future G4 upgrade (faster than 500 MHz) for the Pismo. Their response was that there would never be an additional G4 upgrade for the Pismo because of technical issues (too much heat, larger CPU, etc.). What's more, with the BlueChip G3/800 soon to start rollin' out, the G4 upgrade is most likely to fizzle away due to scarcity of 500 MHz G4 chips. My guess is that we will see a faster PowerPC 750fx upgrade for the Pismo, however. The 750fx CPU has reached 1 GHz, so I'm guessing that as soon as faster G4's are released, the 1 GHz PowerPC 750fx will start showing up in iBooks - and then perhaps an upgrade for the Pismo? If the 1 GHz 750fx CPU is physically the same as the 800 MHz, it should be an identical process to the BlueChip 800. The only reason the G4 upgrade won't come to light is that the newer G4 CPUs are "physically" different to the 7410 (BlueChip 500 Pismo). Oh yeah, there are benchmarks at PowerLogix comparing all 3 CPUs to one another (BlueChip 500, BlueChip 800, and stock 400 MHz G3). They show that the 500 MHz G4 still has "a little over" the 800 MHz 750fx in some AltiVec applications, but it's always close. In other areas, the 750fx chip leaves the G4 in the dust. The 800 MHz 750fx CPU has 512 KB L2 cache running at a full speed. Although the 7410 G4 has a healthy 1 MB of L2 cache, like the original Pismo CPU, it runs at only half speed (250 MHz). I suspect you're right in anticipating ever faster G3 upgrades. Just yesterday Apple released the fastest G3-based computers ever, the 12" iBook 900 and its 14" sibling. IBM can definitely make 1 GHz G3s, but there's little incentive for them to do so until someone (Apple) creates a market for it. At that point I'm sure PowerLogix and other will investigate the viability of offering 1 GHz G3 upgrades for Pismos. I suspect the next iBook revision will finally move it away from the 100 MHz system bus it's used for nearly two years now. To keep it a low cost machine, I expect Apple will go with a 133 MHz bus next time around. The issue of G3 vs. G4 is one we've covered many times at Low End Mac. Prior to OS X, very little software took advantage of the AltiVec velocity engine. Under OS X, the operating system itself benefits from it. Whether a G4/500 or G3/800 makes more sense depends on the OS and applications you use, but for those using the classic Mac OS, a G3/800 probably provides more practical power more of the time than a G4/500. "I am less impressed with the diagnostic and utility programs available at this point. Although OS X has been out for over two years, until DiskWarrior 3.0 ships, there are no drive utilities that can be booted and run from an OS X CD." However, TechTool Deluxe is available on a dual boot CD (it has two volumes) for anyone who purchases AppleCare. That's news to me, but then I bought my AppleCare over two years ago - before Apple started including OS X with new computers, let along a dual-booting version of TechTool Deluxe (TTD). The copy of TTD that I got in a classic-only application. I suspect the "dual boot" version Apple now includes with AppleCare runs it as a classic application inside OS X - perhaps someone who has used it could provide the details. Just reading the OS X on a beige g3 piece from last October - any updates to this re testing with other drives and with the BW video card? Interested to know. I'm kinda looking around for a cheap Mac to run Jag on and (as noted in several of your other LEM pieces) this sometimes doesn't seem to exist! I currently run Jag on a Lombard with 256 MB of RAM, no major problems or complaints, so interested on your findings on the beige, I don't see why it would be any worse I guess! That's not a high priority machine. I did recently do a clean install of Jaguar on it, but other than that I've hardly touched the machine. My third oldest son uses the machine for home schooling (Mac OS 9.2.2, Virtual PC, Windows 95, Switched on Schoolhouse) most of the time, but he enjoys using OS X and Safari when working online. As time permits, I hope to find occasion to overclock the 333 MHz CPU and add a better video card, but between a half-time job in a camera shop, working my tail off to keep up with Low End Mac (the website and dozens of email lists), and taking a little time off for some online euchre and a few favorite television programs, I just don't have much spare time at all. At this point I think the blue & white G3 is probably the best low-end Mac for OS X. It has USB and FireWire on the motherboard, includes much better video and IDE support then the beige G3, doesn't suffer from the 8 GB partition problem, and has lots of expansion potential. I'm looking into acquiring a 300-350 MHz Rev. 2 b&w G3 for use when my TiBook goes to Apple to have the screen backlight repaired or replaced. Someone recommended this site because I'm searching (urgently) for the Spanish version or Mac OS 7.5.2 or maximum 8.1 for a PowerBook 190. It has to be a disk (diskette) because it has not a CD in it. But I don't understand a lot from computers, and also my English is bad. Can you look for me or advise something. I saw something about downloading System 7.5.3. Is that what I need? What does it means? I tried already at a Mac site in Spain, but they don't know what to say. Strange, isn't it? Thank you very much. I hope to get a reaction! First, my apologies for the great delay in getting back to you. When I'm overwhelmed, email sometimes goes on the back burner. With taxes due by April 15, I had a lot more on my plate than usual this month. System 7.5.3 is probably your best bet, since it's freely available for download from Apple's site. But it's not easy to find. First you have to go to their software updates page, then choose the language you want, then select Macintosh, then click on System, and then choose System 7.5 Update 2.0. That finally gets you to a page where you can download the 14 image files needed to install System 7.5.x in Spanish. I don't know of a source for System 7.5.x on floppies. I hope these instructions can help you get the Mac OS on your PowerBook. In your article, "Good News and Bad News About the Jaguar Update and Other Thoughts on OS X," you cover some important points. I'm using OS X now on my new iBook (800 MHz/384 MB/DVD-CD-RW) and use AOL, IE, Mail, Word 5.1, AppleWorks 6.2, and BBEdit 7. It's a nice setup. I don't have Jaguar, but the cost is bothersome. OS 9.2 is a bit unwieldy. I think I'm going to coast on the system that came with the machine rather than upgrade. With Panther just five months off (according to all the experts), you're probably just as well off waiting before investing in an OS upgrade. Jaguar is nice. Safari will spoil you. But until you've used Jaguar, you don't know what you're missing, so you're less likely to envy Jaguar users. Could you discuss ADB vs. USB mouse/cursor - the user experience, including OS 9 vs. OS X and desktops/laptops. And: why don't we use "FireWire" for all our hard drives, including internally if it such an excellent system. I've been using USB mice for years, both under OS 9 and X. I prefer an optical mouse and haven't had any problems at all with cursor control. Others may have ADB vs. USB issues, but I certainly don't. I love USB. As for internal FireWire drives, there's a very simple reason nobody uses them. Nobody makes one yet. Bare Feats recently published test results that found IDE hard drives perform roughly 6% better in FireWire enclosures than they do on an IDE bus, but I doubt Apple would embrace the extra cost of a FireWire bridge on the Mac's internal hard drive for such a minor improvement in performance. For the record, USB 2.0 is much slower than FireWire according to the same article. Yet another option is Serial ATA, which Andrew W. Hill wrote about in December 2001. This new, high speed, serial version of ATA supports a single drive per port (very different from parallel ATA, USB, FireWire, and SCSI) at speeds of up to 150 MB/sec. Compare this with FireWire at 50 MB/sec. and FireWire 800 at 100 MB/sec., and you can see why this is more likely to show up inside new computers than FireWire. First, I must say that I love your site. I read it every day while eating breakfast, and it was instrumental in bringing me back to the Mac world in the first place. 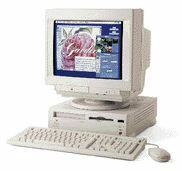 My first Mac was a Performa 6320CD, which I loved at the time. To me it was very stable and functional. I was a hard-core Mac fanatic and told anyone who would listen about the virtues of the Mac. The machine did have some unusual tendencies but never ever crashed. I can't say the same about my friend who bought a Compaq. He was reloading his entire system software once a week. My girlfriend and I bought a few peripherals for the machine, which really made it functional to us in her business, and life was good. For reasons I can't go into here, my relationship with the girlfriend and my Mac broke up - and she kept the machine. I switched over to the dark side and bought a Gateway. The machine was a good one and is still in use today. I just never got along with the clunky Windows 98 operating system, and I didn't feel I had enough control over it. I eventually ended up with the Performa and all of the peripherals and set it up just to mess around with it. Then came the day I was modifying some photographs I was working on and went to print out the results, and my printer was just screwing everything up royally. I checked everything with the printer and found it to be okay. Since the Epson printer I was using could also work on the Mac through the printer port, I set it up and went to print and found it to work flawlessly. I was hooked again but needed some info on how to hotrod the old girl. As it happened, I found your site and read all about the sordid history of that computer, and a lot of my old dilemmas were answered - but the question was how to make it better. I don't want to get too involved in the Performa, because I decided to buy a used Beige G3 266 from a vendor at eBay for 75 bucks. I used all of my old stuff on the desktop to get it fired up and was loving life. The first upgrade I did was max the RAM out to 768 MB. I always follow the links from your page to OWC, who has been my favorite vendor. Their quick service and reasonable prices continue to impress me. The RAM upgrade was about $68. Worked great. At the same time I got cable Internet and was surprised when I had to go through this elaborate setup program on my gateway to get it up and running. All I had to do with my Mac was plug it into the router and set the TCP/IP settings to connect via built in ethernet using DHCP server and Voilà, I was on. The next three upgrades were a little more expensive. I bought a Radeon 7000 card from OWC for $119, and a little later on I bought a Western Digital 60 GB 7200 RPM hard drive for $60. At the same time I ordered a combo System 9.1 and 10.1 pack from OWC and got my first experiences with OS X. I followed your advice on installing it and had no problems. The video card worked flawlessly. I didn't have a lot of applications at the time, so I didn't have much to save. The last two pieces of internal hardware I added were a used 400 MHz G3 processor for $70 that I overclocked to 433 MHz - that again I was able to install without a hitch following the advice on your site, and a Tempo Trio hard drive/USB/FireWire card for $180, which was another major speed improvement. I did have a little hitch installing the Trio because I had to reformat (excuse me, I mean reinitialize) the hard drive in order for it to be recognized. My blunder, but now everything has been chugging along nicely. Until recently. I used System 8.1 only fleetingly before I installed OS X, so I never got to compare the old to the new until I started having kernel panics in OS X, which caused the OS to start crashing. I bought a copy of Norton Utilities 7, and it seemed to help, but I am still crashing a lot. I migrated back to System 9.2, and I've been amazed at how snappy this system feels. The main things I use my computer for are browsing the Net, touching up pictures with Photoshop, and using my financial software (Quicken). The reason I migrated all of my financial transactions to the Mac was because of the "stability of OS X." I should mention that the upgrade path I used for X. I have a full install of 10.0.3, then an upgrade CD to 10.1, which through the free updates from Apple I got up to 10.1.5. I was considering buying a full install of Jaguar, but with the release of the next OS I feel this would be a waste of time. I don't mind reinstalling OS X, but is this something that I am going to have to do continually? Or should I stick with 9.2. I did a bunch of things to "aquify" the look of 9, which again I found at your site, and so far I am happy in 9. No crashes at all, and the speed is very nice. Well, enough of my ramblings. I could go on for hours. Thanks for the great site. I have been reading since 7/2002, and I am continuing to find more new content to me to help me enjoy my computing experience. Thanks for the testimonial. This is exactly why I created Low End Mac in the first place and keep plugging away at it. It's all about getting the most out of what you have, knowing what upgrades make sense, computing on a budget. Mac OS X and the classic Mac OS are two very different operating systems. There's a lot more going on "under the hood" with OS X, which is why it's not as snappy as OS 9. I'm disappointed to hear you've had so many problems with OS X; my experience has been mostly positive, although it wasn't until Jaguar that I was able to make it my primary OS. You shouldn't have to reinstall OS X on a regular basis - or at all. When you upgrade to a major release, it's best to do a clean install, but I never had problems following the same route you outline. Recognize that Norton Utilities usually works just fine, but every once in a while it can cause all sorts of problems. I still think Norton's Speed Disk is the best hard drive optimizer for the Mac, but after being burned once by Norton, I only use it as a last resort. There are all sorts of possible reasons for your OS X problems. Getting a utility that prebinds your applications may help. Beyond that, you might find a lot of helpful advice on G-List, our email list for Power Mac G3 and G4 users. Well, that's today's dozen emails. I'll have more tomorrow.